BEIJING — An explosion in a port city south of Shanghai on Sunday killed two people and injured at least 30 others as it knocked down buildings and left streets littered with damaged cars and debris, the government and news reports said. The early morning explosion struck a riverfront neighborhood in Ningbo, one of China's busiest ports, the official Xinhua News Agency and other outlets reported. Xinhua said it occurred at a factory but a police statement said the cause was under investigation. Two people were killed and two more seriously injured, the district office announced on its social media account. It gave no details of the deaths. At least 30 others were taken to hospitals, according to Huanqiu.com, a website operated by the newspaper Global Times. It gave no details of their injuries. China suffers frequent deadly fires and industrial accidents, often blamed on negligence. Official safety crackdowns have improved conditions in some areas but many companies still cut corners. In 2015, an explosion traced to improperly stored chemicals killed at least 173 people in Tianjin, a port east of Beijing. 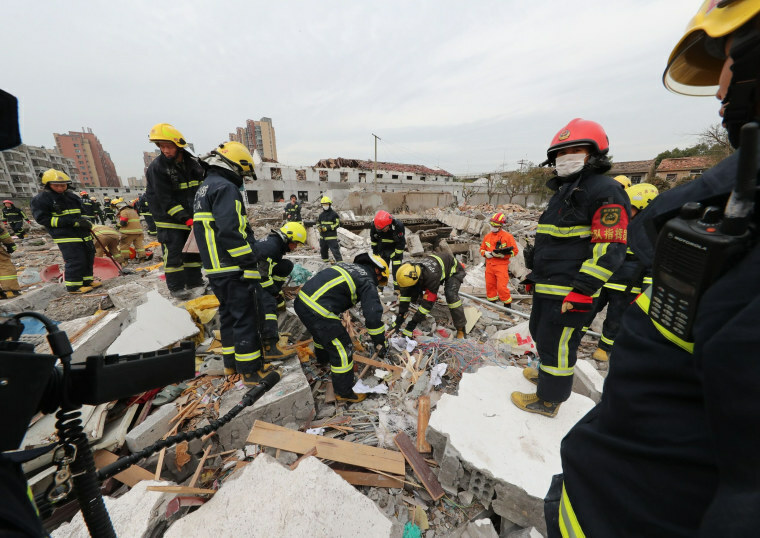 Sunday's blast knocked down residential buildings but those were vacant and in the process of being demolished, Huanqiu.com said. It said there might have been people in the area collecting scrap for recycling. Bystanders said the explosion might have been caused by a gas pipeline that was damaged during demolition work, but the Ningbo gas company said it had no lines in the area, the newspaper China Youth Daily reported on its website. Photos on News.163.com showed an injured woman being carried away on a man's back and what appeared to be the body of man lying in the debris of a wrecked building. Video clips on multiple websites showed a white cloud of smoke rising above the explosion site and rolling across nearby buildings. A photo on news.ifeng.com showed a room in an industrial building with a floor-to-ceiling hole blown through an exterior wall. Other photos showed apartments with windows blown out and glass littering the floors.